Geek Shall Inherit » Geek Shall Inherit Episode 113- Happy National Podcast Day!! 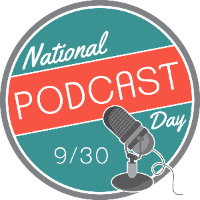 Happy National Podcast Day everybody! Thank you for listening and sharing it with us here at the Geek Shall Inherit podcast! If you dig what we do on GSi this would be the perfect opportunity to recommend us to a friend on this national day of podcast celebration. We love talking all things pop culture with each other and with you folks, but there’s always room for more at the table. So check out this all new episode of the Geek Shall Inherit podcast, and then go check out some other new podcast that you have never heard before. It’s new media and it’s here to stay!. This is a bit of a beefier episode clocking in at 90 minutes. We hope you dig it, and thanks for listening! Also a very special “Thank you” to listener, artist and Eisner Award winner – Art Baltazar. He sent us the best care package full of Aw Yeah! Comics. You should check out all the awesomeness available at AwYeahComics.com! Also check out Art’s podcast! Jason talks a bit about some BBP! newness! Will Warburton to return as the Tick on Amazon? Doctor Who Check in- are we loving Capaldi’s portrayal? The weird Instagram/Twitter thing between J.J. Abrams and Zac Scnhider. Geek Shall Inherit Episode 112 – How Hot Is it?